Two pieces of bread, choice of fillings… sandwich! Little Bird wants to touch the moon. Alfonse tells him that it is too far away. Little Bird says he will touch the moon if it falls to the ground, but Alfonse tells him that it is glued to the sky. Alfonse also tells Little Bird that the moon is made of swiss cheese. Little Bird says that if the moon falls to the ground she will make a moon sandwich. Then a big cloud covers the moon and it disappears. Soon Little Bird sees the moon’s reflection in the water. Little Bird and Alfonse jump in the water to catch the moon. Soon other geese join in. Everyone is searching under water for the moon. They find a rock, a tennis ball, and a swiss cheese sandwich. The geese all fight for a piece of the moon, but Alfonse saves a piece for Little Bird. Little Bird looks up in the sky and sees the moon is still there and realizes that the swiss cheese was not the moon after all. Lily and Salma were best friends. They did everything together, but they each secretly felt sorry for the other because they ate different sandwiches for lunch. Salma ate weird and yucky, icky chickpea paste every day, and Lily ate strange and gross, gooey peanut paste every day. Then one day, it all came out… each one hurt the other’s feelings and the hurt feelings turned to anger. Pretty soon, the whole cafeteria had taken sides. No one had anything nice to say to the other. At first they made rude comments about the sandwiches, and then they made rude comments about each other. And a giant food fight erupted in the cafeteria. The girls were called into the principal’s office. The next day they agreed to take a bite of each other’s sandwiches. MMMmmm! Yummy! 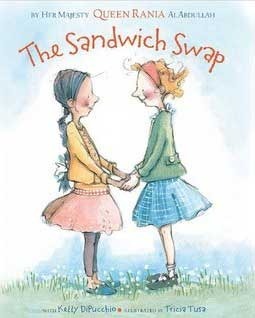 And the girls returned to the principal’s office with a suggest event for the whole school… a sandwich swap!